We all love the BBC. We all should. Like the NHS, it is a very British answer to one of the core questions facing any country. We believe in them, defend them and feel we own them. But as the taxpayer is footing the bill, every penny is under scrutiny. I don’t want to go down a political cul-de-sac on this. Partly, because there is quite enough of that going on right now but mostly because I am no expert on the BBC’s intricacies and sensitivities. My point here concerns the BBC Sounds app, something I know only as a user. And it is bloody terrible. I am interested in it as a podcast player rather than as live online radio. In fact, the only content I consider ‘appointment to listen’ are Essex CCC commentaries, the perfect example of the BBC providing content that the market will not. I believe it has done much to sustain the generally weakening pulse of county cricket in recent years. However, it is worth noting that, to get the commentaries on my phone, I have to use the Tune-In app. In 2019, I doubt that BBC Sounds will carry the county game beyond Five Live Extra, a national station. While the pointless patter of the cricket season is the background track to my summer, podcasts fill my ears the rest of the time. I veered away from live radio in my 40s. For me, it is often too short-form, superficial and often inane, especially sports ‘chat’. These days, I like my niches and the modern podcast portfolio fills them abundantly. 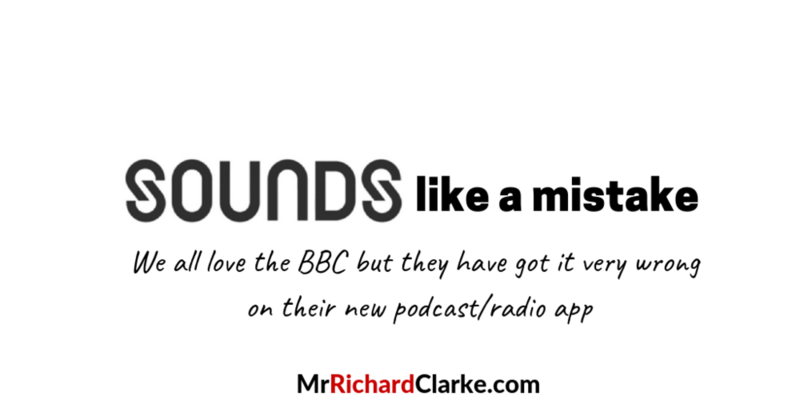 The Sounds app is clearly a priority for the BBC right now and has been relentlessly plugged on all of their platforms, more of that later, so I gave it a go. It feels way behind. The layout is confused, the search function is limited, you cannot share the podcast at specific points only the whole episode and, most importantly for me, there is no ability to adjust the speed. I plumped for Overtime as my podcast app a few years ago because of this feature, the facility to shorten silences and the “voice boost” aids audibility. Sounds had a costly stinker of a launch, partly because it replaced the much-loved Radio Player. Since then there have been stories that certain BBC podcasts are being omitted from general providers or at least delayed in their distribution in order to build value for the new app. More recently, the corporation even looked to add content from commercial stations but was rebuffed. Even audio distribution is at best old-fashioned, at worst protectionist. As a boxing aficionado, I downloaded the Hurricane Tapes, a series about jailed world champion Ruben Carter. Again it was plugged heavily. I came to the show late so downloaded half a dozen episodes and ploughed through them in an afternoon. It was well-researched and produced, exactly the complicated story that amateur podcasts struggle to replicate. However the subsequent shows arrived week-by-week, not in a full series as other narrative podcasts often do and, of course, Netflix pioneered. In the end, I lost the thread of the story and gave up. For me, all this is wrong-headed. There are so many audio options out there now and that any restriction just leads to a “thank you, next” attitude. I want one podcast app with everything in it, organised intelligently and easily controlled. That can’t be owned and run by the BBC as they don’t have a monopoly on the best content anymore and they will never cover all my niches. So I am always going elsewhere. Why not come with me rather than force me to come to you? The relentless plugging of BBC's ‘own brand’ products is becoming an issue as well. The most obvious example is Sports Personality of the Year. It was always a celebration of the sporting annum but it has been seemingly re-invented as an annual cultural highpoint in the UK with a build-up not far removed from a general election. On the afternoon of the 2018 event, SPOTY took up five of the top six editorial positions on the BBC website. Yet a few hours earlier Liverpool beat Manchester United to go back to the top of the Premier League. There was an obvious emphasis on F1 when BBC Sport had the rights and, one presumes, domestic cricket will be prominent in 2020 when The Hundred heralds the return of the county game to terrestrial television. With advertisers to please, commercial broadcasters can do this but not ‘The Beeb’. Now, we all get it. The BBC is under pressure, the license fee is being squeezed (possibly out of existence) and great metrics will help preserve it. Appealing to younger audiences is clearly a priority. I presume this explains the stream of YouTube-style video oddities on the home page. But trying to beat a modern global video platform, podcast outlet or any other free-market content provider is not feasible given the restrictions the BBC must work within and, of course, they are copying not leading. Commercial-style tactics cheapens their brand, erodes faith and makes you think they should go all-in, start selling the silverware and, yes, scrap the license fee. But I am firmly against that. Media has utterly changed during my adulthood, let alone my lifetime. When I was growing up I could not imagine a world without TV and did not quite comprehend the concept of sitting down… listening to the radio… and doing nothing else. The internet connected us, social media gave us a platform for our opinions now YouTube and podcasting has given us the means to create and distribute content competing with the traditional broadcasters. And those podcasters and YouTubers are already legitimate voices. Contrary to the worrying words of a very experienced BBC Sports broadcaster at SXSW last year, they do not need the ‘reward’ of exposure on traditional platforms for validation. But while the market decides the quality of general content, the BBC should be a guarantee of higher standards with a wider view. That is why Sounds app and the approach behind it has been so disappointing. Likewise, iPlayer was revolutionary in its day but now looks the pale shadow of the UX on Netflix. It is not leading it is playing catch-up and needs to accept its new role. After all it is still worth its license fee many times over. In the UK, Sky’s millions have utterly reshaped sport and its coverage over the past two decades. Netflix is well on the way to doing that in movies and light entertainment. The BBC still has authority in news but even that is under threat. The corporation used to go by the nickname of Auntie, a moniker that grew up in the 1950s in response to the introduction of the “loud and brash” alternative on ITV. There was also the notion that “Auntie knew best”. But it does not anymore. Part of the family, good for some things, possessing worthy opinions on occasion and you certainly want them around. But, as the world has left them behind, you listen to others more intently. And you certainly switch off when they act as if their voice is the only one worth hearing. What's the story, sporting glory?